Melvin K. Smith, a three-time graduate from Auburn University’s College of Education and special events coordinator with Auburn’s Career Center with 28 years of service, has been recognized by the Alabama Association of Colleges and Employers (AACE) Board of Directors for his meritorious service to the organization and profession. Smith received the resolution during the association’s annual meeting in Gadsden, Ala., as it celebrated its 40th anniversary. He was also presented a plaque and a monetary contribution for being selected the 2015-2016 Outstanding College Professional of the Year – an award he also received in 2006-2007. AACE recognized Smith for his many achievements and combined contributions to the organization, which has been exemplified through his outstanding professionalism, commitment, and cooperation. Smith said he places high value on the education he received at Auburn, which inspires both his role as a professional on campus, and as a leader of his professional organization. 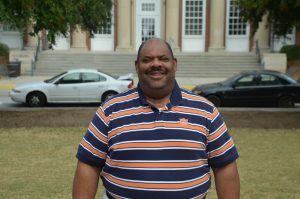 Beyond his outstanding service to both Auburn and the AACE, Smith has roots that run deep in the community. In addition to his mother, Smith’s father was a chef at Sewell Hall, which for years was the residence facility for Auburn Athletics. Going back another generation, Smith’s grandfather was the personal chauffeur for Dr. Ralph Draughon, who was Auburn’s president from 1947-1965. Smith is looking at retirement somewhere down the road, but plans to always be part of Auburn.